At Holmes Honda, we pride ourselves on our expert Honda service and maintenance teams. We are dedicated to our commitment of getting customers back on the road as quickly as possible. We also take pride in fixing our customers’ vehicles the first time, which is why we were awarded the Fixed First Visit Award by American Honda Motor Company! 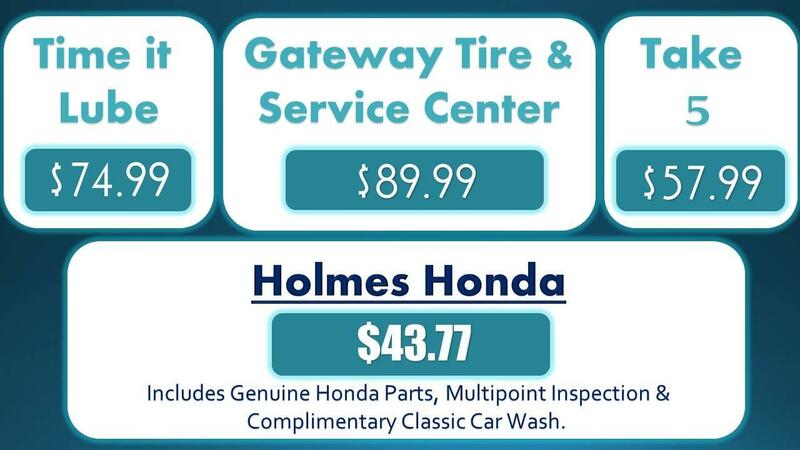 If our efficient and knowledgeable staff weren’t enough to bring you in to Holmes Honda Service Department, we also offer the best price and parts in town as recommended by Honda Motor Company! 0-W-20 weight synthetic blend oil change and filter replacement. Top off fluids, set air pressure in tires, multipoint safety inspection. Plus receive a complimentary car wash! We’ve shopped the competition, and are excited to offer our loyal customers the lowest oil change price in Shreveport. If you would like to schedule a service appointment, simply click HERE, contact us at 318-212-1200 or fill out the form below if you have any other questions!